Various advanced kitchen tools and gadgets are available nowadays that eases your kitchen tasks without any hassle. You can cook awesome foods in no time by using these smart kitchen appliances. And Food Processors are one of the best among them that is now one of the essential things you all must have in your kitchen. Whether you are a professional chef or a homemaker, the food processors can do a lot more while saving your time in the kitchen. Food Processors are the multitasking appliance that enables efficient, faster, and effortless cooking experience. Even the toughest recipes you can make in very less time with this smart appliance. You can effortlessly do a variety of tasks like shredding, chopping, dicing, slicing, pureeing, juicing and even dough mixing without putting much more effort. So, if you are planning to buy a food processor for your kitchen, the blog will definitely help you in picking out the best one. Well, there are lots of brands and models available with distinct features, so it is quite a cumbersome task which one to buy. For your ease and convenience, we came with this blog post where we have lined up the best and latest models of food processors to choose accordingly. Let’s have a quick look on our best picks. Here is the detailed review, features, and specifications for each model to get your favorable one. This multitasking appliance from Philips eases your work in the kitchen and offers the best performance. It comes with a powerful 700 W motor that performs various functions very efficiently. 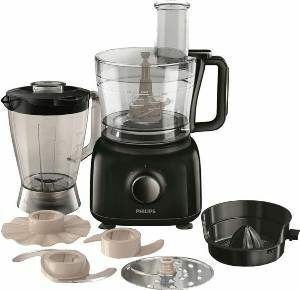 This model of Philips food processor comes with a variety of attachments that helps you in grinding, mixing, liquidizing, chopping, slicing, dicing, grating, juicing and even dough making. And so, making it convenient to create awesome recipes without any hassle. It also has a superior power chop technology that gives the best chopping of both the soft and hard ingredients. 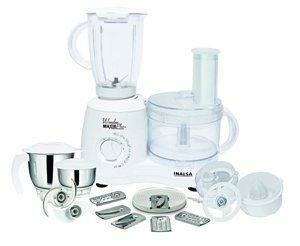 Power and performance is all this food processor from Inalsa boast about. This user-friendly appliance can ease the operations like cutting, grinding, chopping, mixing, kneading, and juicing with its powerful advanced 700-W motor. It also comes with overload protection to ensure safety. 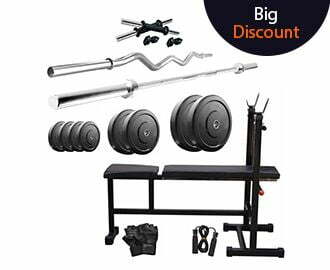 Moreover, its user-friendly action makes it very comfortable to use. A range of jars come with it that you can use in accordance to your need and requirement. 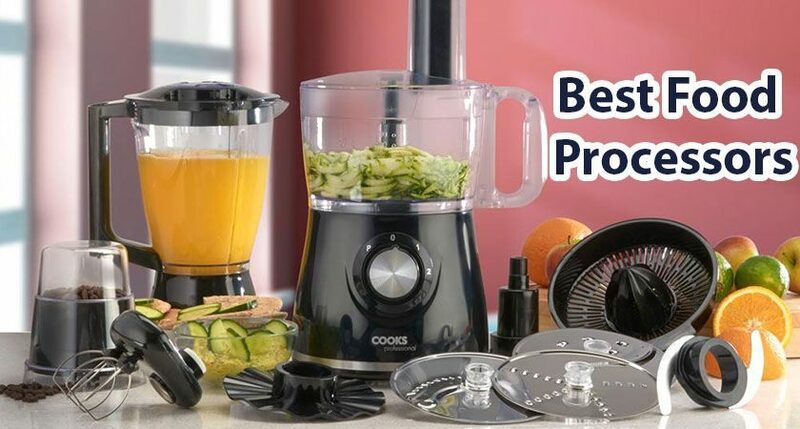 Cake and cookie making, chopping vegetables, preparing masalas for awesome recipes, making fresh juices are all now getting easier with this amazing food processor. This great electrical appliance helps you in every possible manner in the kitchen and gives you an easy and effortless cooking experience. It comes with an S-blade, slicing tool, coarse shredding tool, fine shredding tool, a jar, a reversible disc, and a kneading tool and thus helps you to make awesome recipes in no time. A citrus press is also there for getting fresh fruit and vegetables anytime whenever you want. Save excessive effort in the kitchen with this smart food processor from Inalsa and make great recipes for your loved ones in no time. 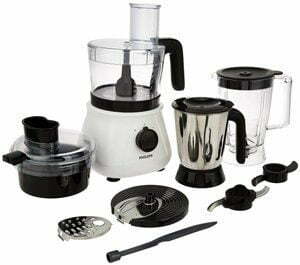 It comes with a sharp stainless steel blade for superior chopping, slicing, shredding, juicing, blending, whisking, etc. The appliance also has an intelligently-designed knob for different functions that you can use accordingly. The multipurpose blades come with it are used for different cooking requirements. The smart citrus press is also there for getting fresh juices anytime. 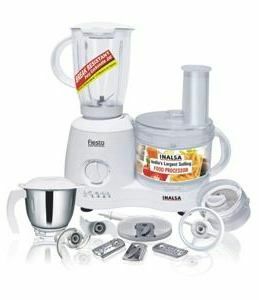 This multipurpose food processor from Bajaj is a great way to add convenience in all your kitchen activities. This food processor saves a lot of time in the kitchen and gives a comfortable and convenient cooking experience. It makes the toughest job of kneading, mixing, grinding, shredding, chopping, and even juicing very easy and quickly. The smart safety features equipped with it enables you to use it more safely and conveniently. This one is absolutely a great buy for effortless cooking. This food processor from Renesola has a lot of unique features that make it the best choice for your kitchen. It comes with full 16 attachments that perform the function including grinding, slicing, shredding, chopping, mixing, juicing, and kneading very efficiently. The variable speed control enables you to perform the operation accordingly. This model from Morphy Richards is one of your best kitchen-mate in doing all kitchen activities very efficiently and quickly. Not only, you can chop, mince, grate, but also can do a lot more with its smart 16 functions. 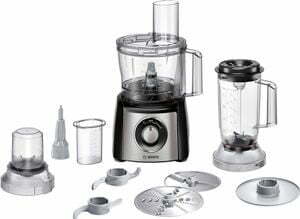 This food processor comes with a Quadra flow technology that assists in best blending, grinding, and juicing. The different blades let you perform various functions very quickly and perfectly. It is another best food processor in our list from the brand Morphy Richards. Get the hassle-free experience of cooking food in your kitchen with this smart appliance. The appliance can easily do the job of shredding, slicing, juicing, kneading, and mixing, etc. very easily and efficiently. It works on the quadra flow technology that results in perfect grinding and blending of the ingredients. 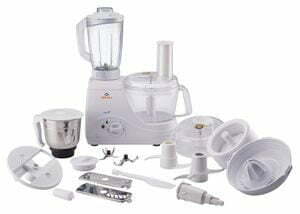 This food processor comes with a powerful 1000 W motor that can perform the toughest job of grinding very effortlessly. The appliance also offers you the option of customize slicing with its seven different variomatic slicing feature. There come four jars for various functions including the chutney jar, grinding jar, liquidizing jar, and the processing jar. Plus, a centrifugal juicer is also there to make healthy and fresh juices whenever you want. The Bosch Lifestyle MCM3501M Food Processor is your perfect kitchen assistant that makes cooking not only easier but also fun. This single appliance comes with more than fifty applications including kneading, chopping, grinding, grating, whipping, and much more and that’s why a highly multi-functional food processor. It also has two-speed settings along with the moment function that lets you control the speed as per your need and requirement. This one offers the quick blending as well as grinding of the toughest products with ease, thanks to its multilevel six knife with three double blades. And moreover, the best is its powerful 800 W motor for all the tough food processing applications. There comes a compact bowl with it that makes it easier to store all the attachments included with it more appropriately and neatly. And last but not the least, there is again a model from the brand Inalsa. 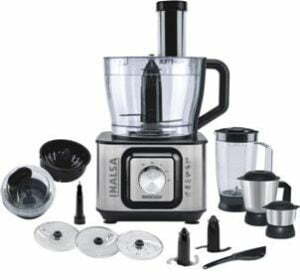 The Inalsa Fiesta Food Processor is a complete kitchen tool that aids in doing grinding, chopping, juicing, grating, and a lot more in a matter of minutes. The appliance has four functional blades and cutter offering you the smooth grinding and chopping all you need for your cooking. It also comes with the dough maker and an egg whisker, so you can also easily prepare the items for baking too. The appliance has three-speed settings along with the pulse feature that lets you control the speed accordingly. The capacity of the blender jar is 1.5 l that is good enough to prepare a large amount of juice in one go. Plus, the compact size of this food processor makes it very convenient to store it properly. How does a Food Processor work? A food processor comes with a work bowl that is to be fixed on a motorized drive shaft. A feed tube is there on the lid of the bowl from where you can insert the food you want for chopping, dicing, slicing, grinding, pureeing, or even kneading the dough. Most of the food processors come with various disks and attachments for different activities like grinding, juicing, etc., etc. Also, the S-shaped blades in a food processor help in doing all these activities very easily and quickly. You just need to plug it out, insert the food, and attach the disk based on what you need to do with the foodstuff. It’s so simple and gives an effortless cooking experience. Here is a video showing it works. This one is the most important attachment of the food processor that is used to collect and process food. Generally, three main sizes are available for a food processor- Full, Compact, and Mini. The full-sized bowls come with the capacity of 9-13 cups. The compact sized bowls come with the capacity of 5-7 cups. And the mini-sized bowls can accommodate 2-5 cups. Discs and inserts are another important attachment in a food processor that lets you performs several tasks on the food you have inserted in the bowl. Different inserts and discs include dicer, slicer, chopper, shredder, etc. Different type of blades is available with the food processor that you can use accordingly to perform various tasks including chopping, grinding, mixing, juicing, etc. These blades are made up of strong metal, normally stainless steel for durability. A food processor generally comes with a cover to wrap the bowl. The cover helps in preventing the food from being scattering and spreading here and there due to the force of blades. And thus, it is ensuring safe mixing, grinding, and chopping, etc. The best models of the food processors come with a completely digital control system including various switches and buttons to operate accordingly. And you can easily control the speed of the blades by using these switches and buttons based on different types of recipes. This another important attachment in a food processor lets you make fresh fruit and vegetable juices very easily. Food processors work on the power of the motor, so it is advisable to choose the model with high motor power. Food processors with highest motor power enable you to do tough cooking activities like kneading, grinding, juicing, etc. effortlessly in no time. The best models come with a minimum power of 750 Watts that performs very well. We have already discussed about the bowl capacity above. So choose them according to your need and preference. models have limited attachments and accessories. So it is advisable to choose the model on the basis of your need, convenience, and budget. 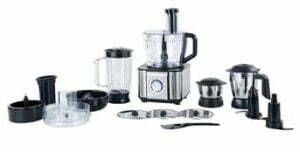 Food processors come in different sizes and weights. If you are a professional maker or even have a large family, you must choose the full sized models. For a family having 5-7 members, compact models are the ideal choice. And for a small sized family, it is advisable to choose the smaller models. This is all about the best food processors in India you can buy for getting an effortless and efficient cooking experience. For easier and faster food preparation in the kitchen, food processors help you a lot. Even it is the best kitchen tool that saves a lot of time and effort into making delicious recipes. So, I am sure the presenting blog and mentioned buying guide would surely help you in picking out your favorite model for the kitchen. Still, if you think anything is missing in the blog or for your any recommendation and suggestion, please pen down to us in the comment section below.